Timberghost Static Recurve, 47@27. GT 3555, 100 gr Stingers 4-blade, 100 gr inserts. Looks darn cold up there! I don't think you track much in snow; huh, Bisch!? Hope all is well! No, but I sure would love to shoot a critter in the snow one day, just so I can track one in the snow!!!! Man that looks COLD! 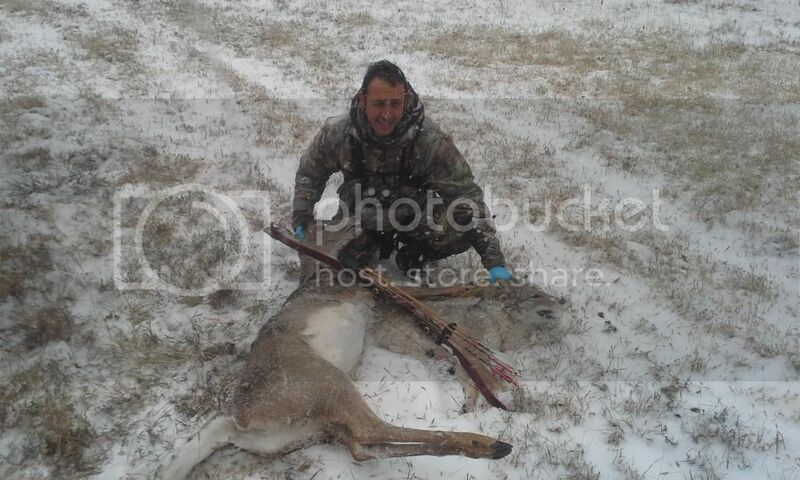 Congrats to the cold persevering bowhunter. Talk about predator and prey! That rocks. Congrats again Mono, Wheatland Christian Bow Hunters did great this year!! Congrats! Looks like fine shooting all the way around. Need to make a hat out of that coyote. You look mighty cold in that picture!